Blade Runner 2049 came out last weekend, facing the challenge of both honoring and updating the aesthetic of one of science-fiction cinema’s most beloved films. The filmmakers who made the just-released sequel rose to the occasion by imbuing the movie with a hauntingly appropriate approach to illumination. The first Blade Runner popularized a sort of future-shock vision of cyberpunk and that aesthetic imprint is all over the place now, and people are familiar with it. Can you talk about, aesthetically, some ways that you want to surprise people again? It was a long process to find the keys. The keys were in the screenplay and the ideas of Hampton about how climate evolved. Climate for me was a key because [changing] climate means different kind of light. And that was something, with Roger Deakins, we explored those ideas and came back that we feel is deeply inspired by the first movie but slightly different. When I saw Blade Runner 2049 last week, it was immediately apparent how much work Villeneuve, director of photography Roger Deakins, and their cohorts put into the filtering and obscuring of light. Here, truth lives in darkness, which fits with the movie’s noir genre aspirations. Light carries information. Light creates memory. But it also can be used to channel falsehood. In a world where fake memories look just like real ones, luminescence is unreliable. The holograms and other visual overlays that are a fact of life in 2049 also serve as avatars of a broken world, where what it means to be human is an explosively evolving idea. As seen in the Wallace Replicants offices and in Ana Stelline’s memory-making facility workshop, only the rich can afford clean light, and, as a corollary, anything clearly lit is meant to be mistrusted. When we first meet Stelline, the dazzle of the tropical environs that surround her is shocking and ultimately revealed to be fake. She’s making a birthday memory when Officer K calls on her, paying particular focus to the candlelight. If the radiance of the flickering flames aren’t realistic enough, the memory won’t be effective as a psychological anchor. The more brightly something shines in Blade Runner 2049, the less likely it is to be trustworthy. Pure sunlight only appears a scant few times—most significantly, we see a few shafts when K meets with the Replicant insurgency—and, overall, the clearest electric light feels like harbingers of danger or signs of moral offense in this movie. The blinking eye of the faraway drone that kills scavengers, the red tripwire indicator in the decrepit Vegas hotel, and the sinister blue data node of mad corporate prophet Wallace all represent hazily seen threats in waiting. They remain hidden or misunderstood in plain sight until the realities behind them are unleashed. All throughout the movie, K and other characters are followed by remote spotlights and framed by indirect rectangular radiances. But Blade Runner 2049’s use of light isn’t just dramatic; it’s thematic, as well. The lead-up to the meeting of K and Deckard showcases this implementation. The gauzy atmosphere of post-dirty-bomb Las Vegas comes across like a purgatory. There’s a glow in the air but we never see a light source. Is it day? Is it night? This uncertainty—which seems to call back to the old Sin City tradition of not letting folks know what time it is—creates a thick suspicion. Later, when the beams of the holographic Elvis stage show dance around the room, suspicion explodes into assault. 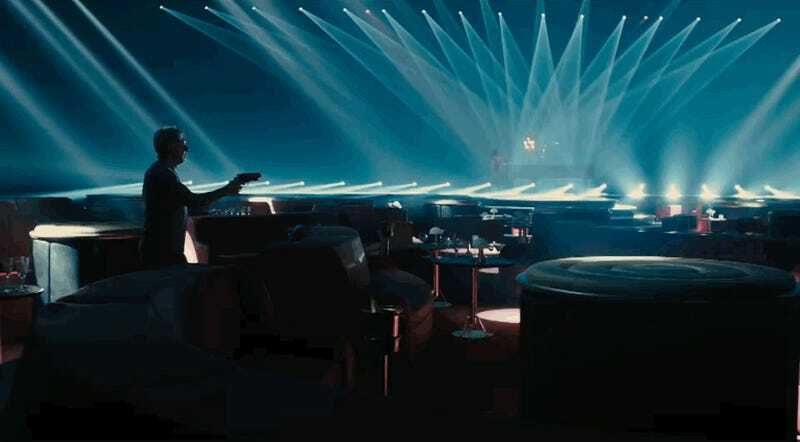 The elaborate light show serves a mnemonic tether to the future-slave exploitation that connects Deckard and K. One of them is the subject of a manipulation of the truth while the other has done the manipulation to obscure his own past. When Deckard and Wallace face off in the latter’s moodily illuminated offices, the elder man growls that he “knows what’s real”. For all the light and power at Wallace’s command, he doesn’t have the means to create a new kind of life. It’s not a coincidence that the fate of that miraculous new life gets resolved in the movie’s murkiest scenes. The swirling chaos makes for a perfect cyberpunk climax because it’s dim and tough to see anything at all. 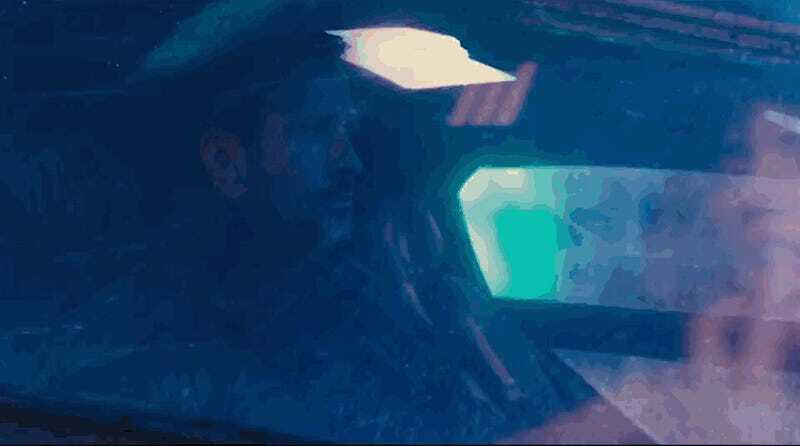 Poor visibility is the most recurrent visual trope in Blade Runner 2049, a sign that we can’t trust what we see in the future that’s coming.